A few years ago, after giving a talk about ToaruOS, someone came up to me and expressed some disappointment that ToaruOS used Newlib as a C library and employed Cairo and FreeType in its userspace. If it wasn't all entirely from scratch, they lamented, was it really my own OS? While I think their conclusion was a stretch, those comments have eaten at me in the back of my head for years, and with my work on mainline ToaruOS winding down after the release of 1.0, I thought maybe it was finally time to address them. ToaruOS-NIH is a ToaruOS distribution with no third-party components. While the kernel remains mostly untouched (some PCI Database headers have been removed, and there was a general restructuring and deduplication of headers and datastructure implementations between the kernel and userspace), a lot has changed in the userspace. Gone is Newlib, replaced by a (very incomplete) in-house C library. Gone is Cairo, with the compositor now using its own SSE-accelerated alpha blitting as an extension and improvement on the existing ToaruOS graphics library (other consumers of Cairo were mostly Python applications that are still in the process of being rewritten, or were trivially replaced with the native graphics library). Gone, too, is FreeType, replaced with a very special text rasterization method. At the moment, Python is also missing - currently due to incompleteness of the C library, but also as I wanted to take this opportunity to port some of the more important functionality that was originally implemented in Python back to C for performance reasons, and to make it more widely accessible to C applications throughout the OS. Finally, GRUB has been replaced by a purpose-built in-house bootloader, though not much focus is placed in this area and it remains limited in its hardware support. But ToaruOS-NIH is more than just removing third-party libraries. As functionality has been ported from Python to C, many improvements have been made to the operating system as a whole. The window decorator now includes context menus. New window management options have been added. Clipboard support is now present in the compositor, with the terminal supporting text selection. With the complete nested menu library ported from Python, applications like the terminal also have a menu bar available. ToaruOS-NIH also includes a completely new build system, which is much faster and better organized than the original ToaruOS build process. Ultimately, the goal with ToaruOS-NIH is to replace the core of ToaruOS and eventually support all of the applications that were previously ported to the Newlib mainline distribution. PS: With this announcement, ToaruOS is migrating to GitLab from Github. I have to admit that I sometimes thought about ToaruOS: The user-space is nice but except for the compositing system, it is all ported and the system-level stuff is nothing special. However, your NIH port proves that wrong. It is a very impressive amount of code that you produced there; I have much respect for the NIH port. I'm especially impressed that you could replace Cairo and FreeType without affecting visual quality. How does the performance of your own graphics routines compare to Cairo's and pixman's optimized routines? I'm happy to announce that ToaruOS-NIH's C library has reached the point where we can build Python again, including support for the ctypes module. Even the Yutani (windowing system) bindings are working. How does the performance of your own graphics routines compare to Cairo's and pixman's optimized routines? Poorly, I'm afraid. Cairo does some really amazing tricks to ensure efficient rendering, and I'm not quite there yet. I have a new build with Python available here - it's a bit big and takes some time to boot. I checked it out and the performance seems to be good on my machine. Only when I start >4 of those plasma demos, compositor lag becomes an issue (i.e. it gets noticeably slower to move around windows). That's better than I expected - I suspected that it would be very hard to beat Cairo. Certainly very nicely done. - The netboot loader (now called "netinit") is back, though missing gzip and TLS support. - An EFI bootloader is now available, in both IA32 and X64 forms, so even if you have an old 32-bit EFI system it should work. The EFI bootloader is much more robust than the BIOS loader, and has been tested on real hardware. - Significant improvements have been made to the C standard library implementation for compliance with the standards. - CDs are now built as ISO/FAT hybrids and contain both the BIOS loader as an El Torito payload as well as the EFI loaders. The ISO filesystem describes the files contained with the FAT image. - Several more applications from mainline have been ported over. - A number of bug fixes have been implemented in the kernel and driver modules. - A headless boot mode is now available, along with tools to run login shells on serial ports. - Support for VirtualBox's Seamless mode and hardware cursor rendering have been added. - With the addition of PAT support, the framebuffer drivers now function properly on real hardware. - A number of changes have been made to the init system for better session management. - The old C graphical login screen has been revived and ported to work with the new glogin system. Recently, I've been focused on "quality of life" improvements for the OS - adding more commands, making the system feel more like a "real" OS. Moving forward, I'd like to revive support for hard disk installations and write an installer application. Volatile releases are available from my website. I prefer this version over the other one just because you ditched all the third-party components. I tested it in both the Virtual Box and Qemu and I'm amazed by how fast it is. Maybe it's just my beefy PC or you really know how to optimize a compositor. You could burn the ISO to a CD, that should work. 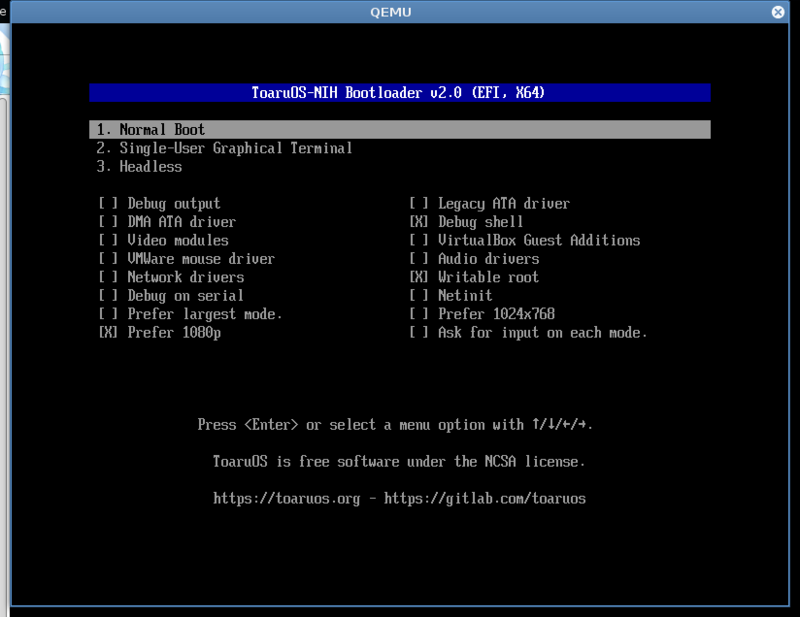 Boot it with EFI for best results - the BIOS loader is only built for QEMU. You'll need to select a video mode option as the default is to let the native drivers do modesetting and those only work in VMs at the moment. Alternatively, you could copy the kernel, ramdisk, and modules directory from the CD into the root of an existing EFI system partition, along with the the appropriate EFI loader (probably bootx64.efi - rename it to something more identifiable) - this is what I do normally for testing (I use rEFInd on my desktop as a boot menu, and it detects my loader and provides a menu entry for it). You may also want to disable all the extra hardware drivers, as shown here, just to ensure none of them interfere (you won't need them to run the desktop, and you likely don't have the hardware for the network or audio drivers anyway). and just stops. I tried switching to legacy, nothing changed. Tested on two machines (one is from 2017, one is from 2003), neither worked. You have a UEFI machine from 2003? That seems... unlikely given that UEFI is from 2005. The 2017 machine may be having issues jumping back to protected mode... I will need to investigate. e: I may have accidentally told you to turn off the video modules - definitely turn those back on. e2: I'm investigating issues with booting on my Surface, which seems to be failing to exit EFI boot services, but then also fails later after loading the kernel. lol, that thing can barely boot, let alone have UEFI. I figured it out, but everything stayed the same. Is 512 MB of RAM enough to run the thing? I guess I won't be having a pleasant experience, but at least some VGA (text mode) would be nice. The BIOS machine is probably not going to work with my loaders, but you can try to set up GRUB 512MB should be enough. I'll get back to you on the EFI machine if I get my Surface working. I have a debug build you can try that may get me more information; I'll upload that somewhere when I get ~to work~ home. Btw I managed to compile your toolchain, +1 for the simplicity. Right now I'm messing around with your OS. Dude it took me like 10 minutes to find a way to change the terminal background color. Still couldn't find the name of that gray/brownish thing that sits below the application title. Sorry, haven't had much luck... Surface had a problem with ExitBootServices, but I don't have a solution for it yet (and the kernel was seizing later during boot anyway) - will look into it more this weekend. I don't know how to take that... a suggestion that I improve themability? The terminal in particular isn't specifically set up for good color theming. Menu bar. Color is currently hardcode in lib/menu.c:menu_bar_render, default is #3B3B3B (so while it may appear brownish, it is actually a pure gray), which matches the color of the default decoration themes.